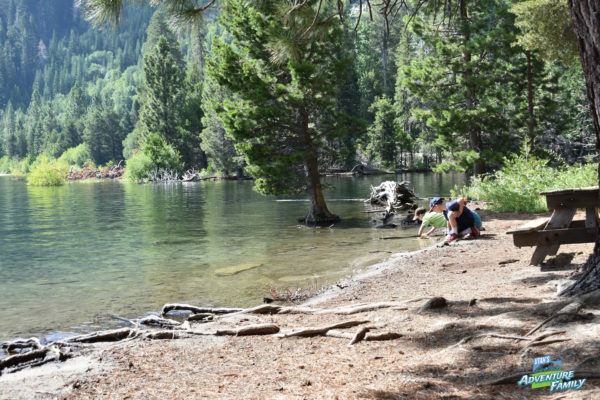 Emerald Bay is our favorite place at Lake Tahoe. This is a gorgeous state park area on the California side of the lake. 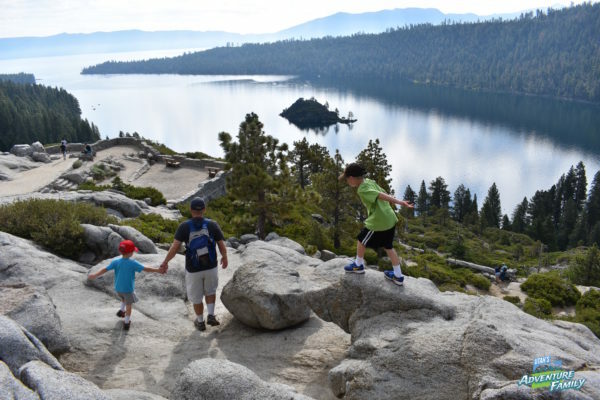 We spent a day exploring, and we found some fun things to do at Emerald Bay. 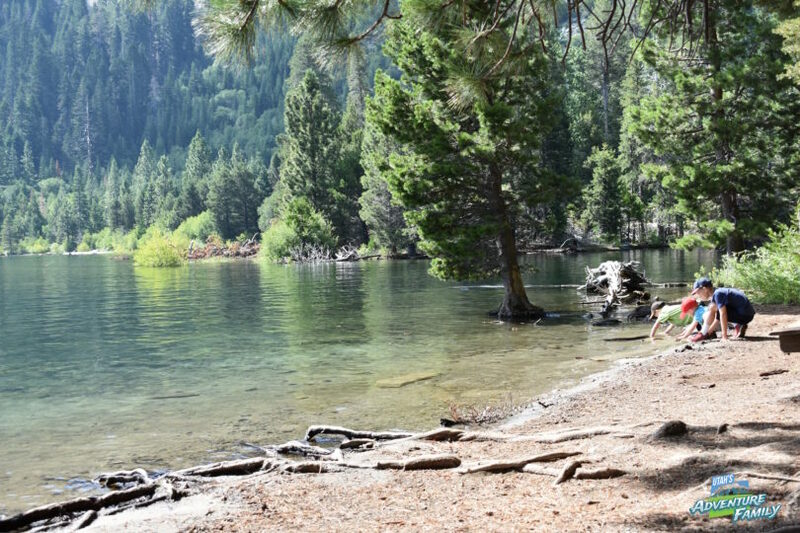 Because the parking lot is small at Emerald Bay State Park, we recommend getting there as early as possible. 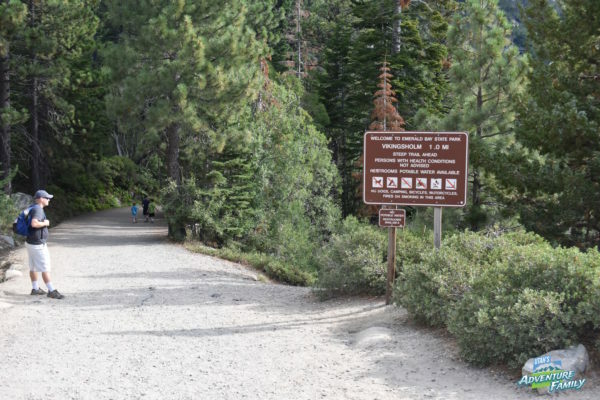 The drive to Emerald Bay through the thick forest is beautiful, and there are supposed to be bears, though we didn’t get to see one. 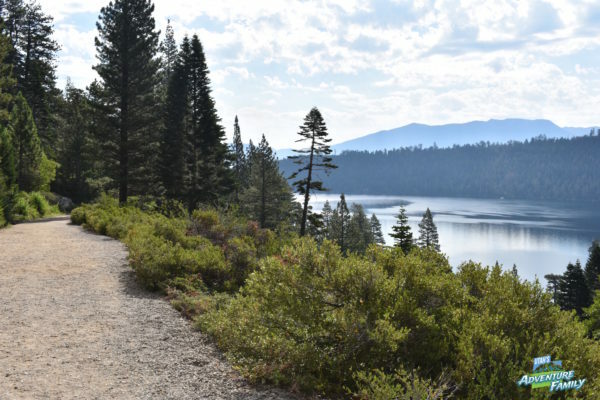 If you approach Emerald Bay State Park from the South Lake Tahoe, you will want to stop at Inspiration Point. There is a small pull out where you can get a beautiful look at the bay and Fannette Island in the middle of Emerald Bay. Then continue around the end of the bay to the parking area. 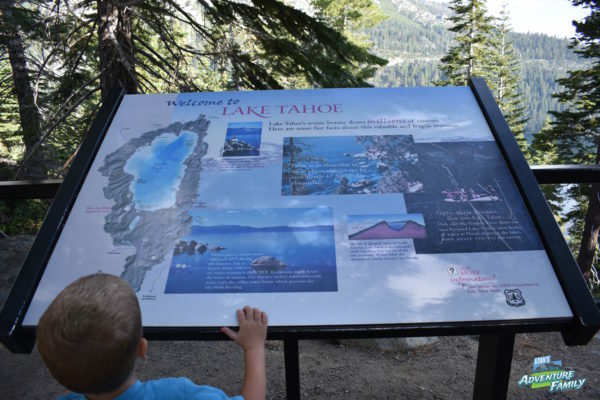 There are a few informational signs at Inspiration Point. 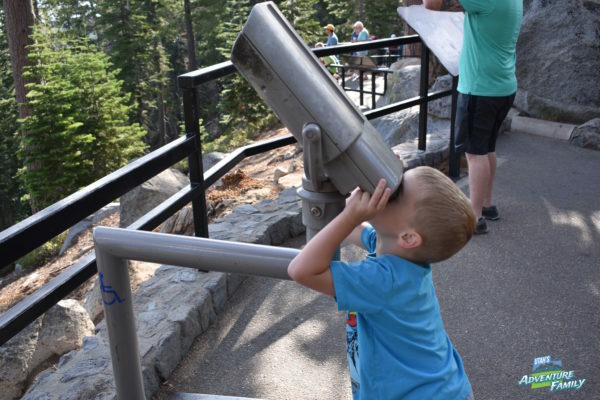 Our boys enjoyed the telescopes that are available to look through. You have a great look at Lake Tahoe. 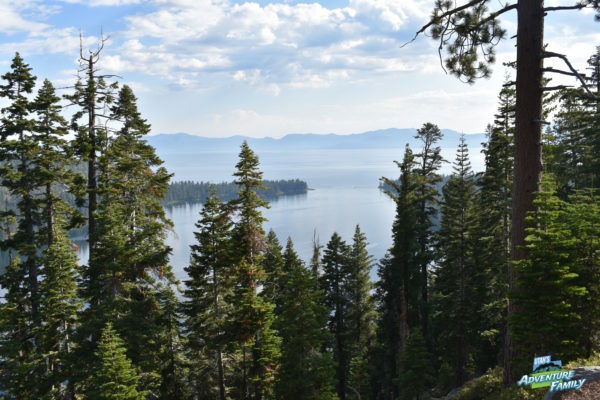 And you can see Emerald Bay really well through the trees. The first thing to do after you arrive at the Vikingsholm parking area is climb the large pile of rocks next to the parking lot. It looks like a granite dome. 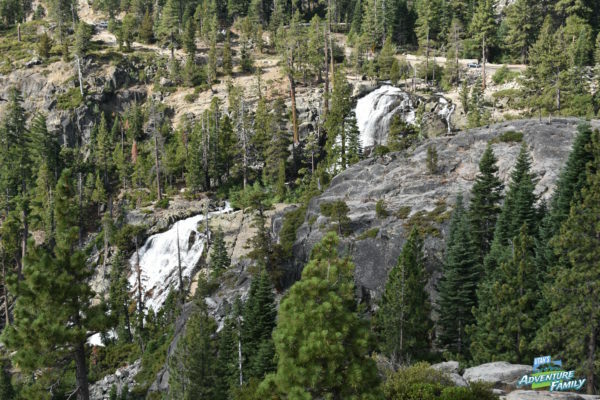 By looking down and to your right, you can see Upper Eagle Falls, which is really beautiful. 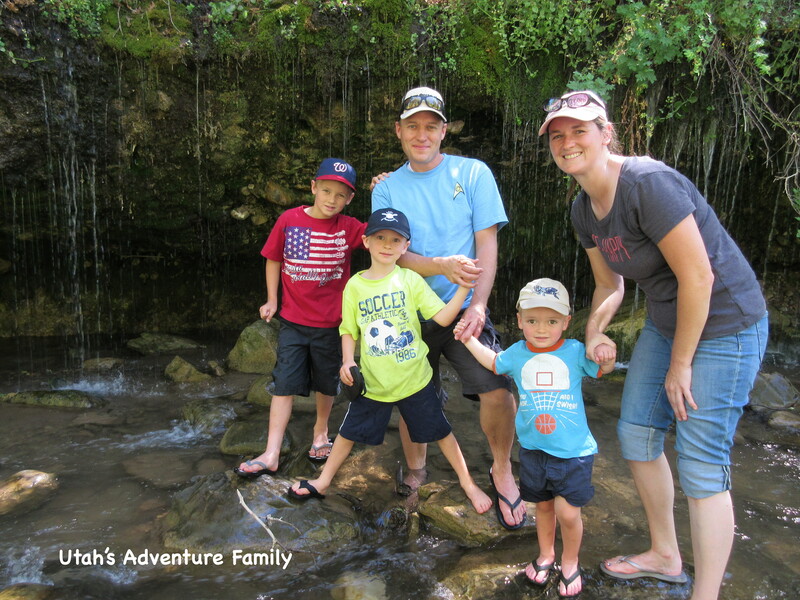 Some hikers like to walk down to it, but we much preferred Lower Eagle Falls, which we’ll describe below. 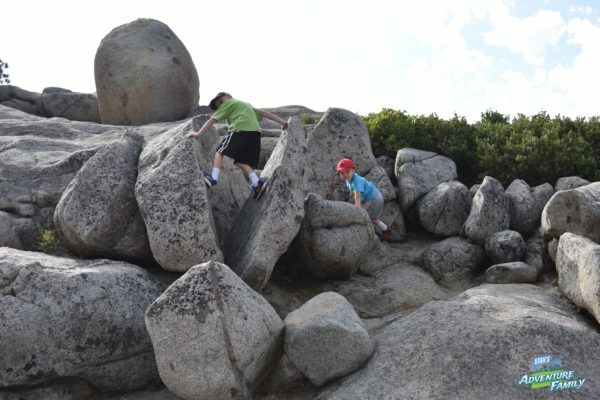 Our boys thought climbing the rocks was really exciting. 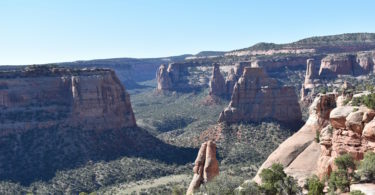 There is also an overlook. You can walk around to the overlook without climbing the rocks. Eagle Falls (upper and lower) are beautiful waterfalls. From the parking lot, there is a one mile hike down to the bay. Don’t worry, though, the trail is wide and well traveled. We enjoyed the walk down the hill remembering we would have to climb up when we were done. Luckily, the trail is well shaded. At the bottom of the hill, there are a few different things to do. This is the start of the trail. 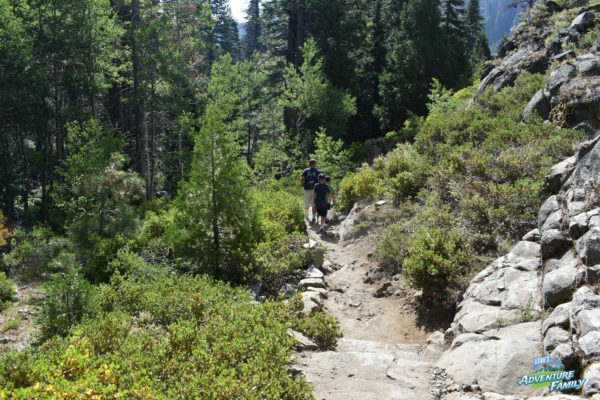 The trail weaves through the trees, and also offers some views of Emerald Bay. 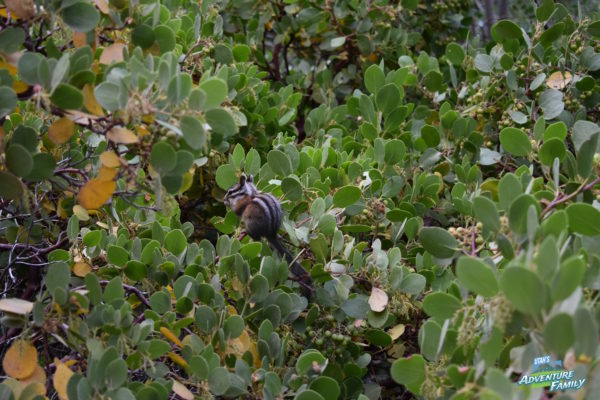 We saw lots of chipmunks and squirrels. 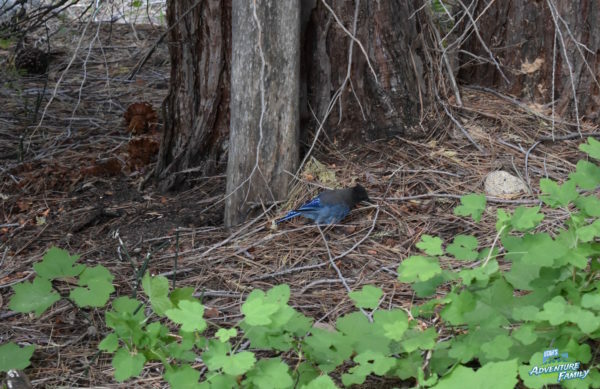 There are Stellar’s Jays all over! Vikingsholm Castle is pretty impressive. The first thing to do when you reach the bottom is get tickets to Vikingsholm Castle. This costs a little extra, but it is well worth it ($10/adults and $8/children ages 7-17). Get your tickets as soon as you can get down because the tours will sell out. 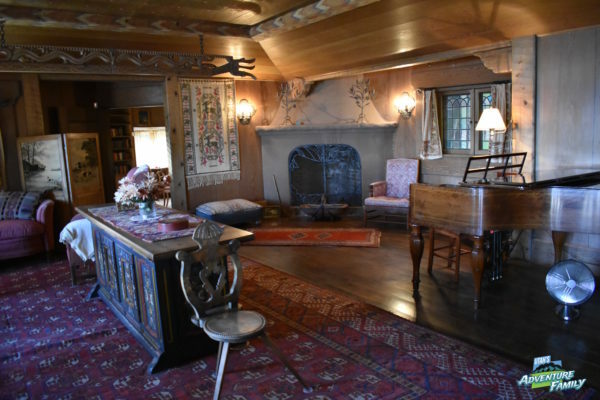 Tours are only available from 10:30-4:00 from the end of May through September. 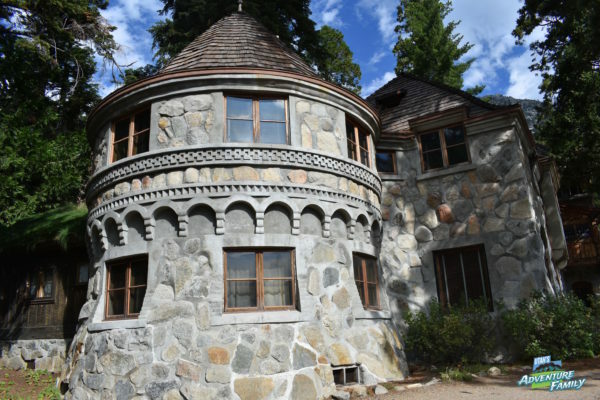 The castle was built around a hundred years ago by a Scandinavian immigrant widow. 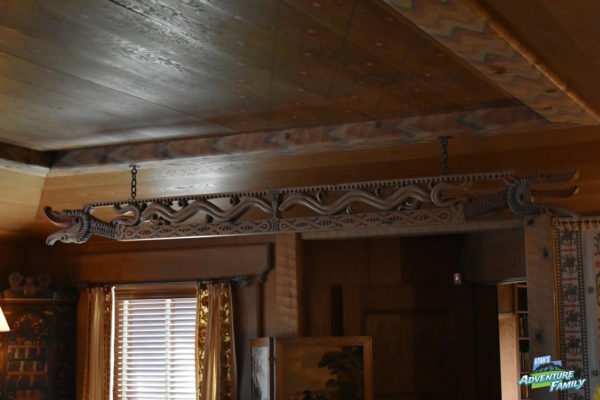 She was very wealthy and spared no expense, importing much of the furniture, and decorating the castle with all kinds of carvings and décor from her homeland. There are quarters for servants, and a small courtyard as well. 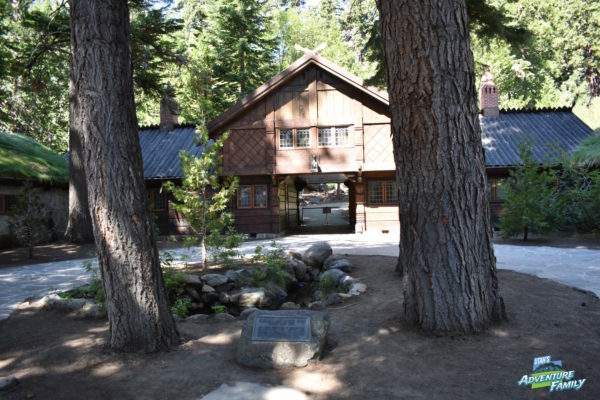 This woman owned the entire bay, and she had a teahouse built on the only island in Lake Tahoe. You can still see it from the shore. She also insisted that the builders of the castle not use any local lumber, so the trees surrounding the castle are ancient and beautiful. We really liked the tour of Vikingsholm Castle. 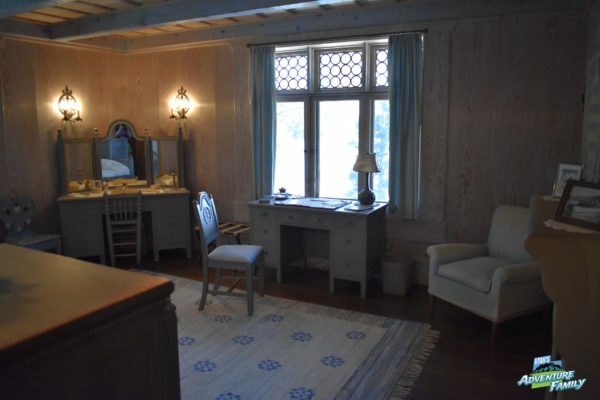 Each of the rooms is unique and has many beautiful items. There are lots of viking references like dragons. 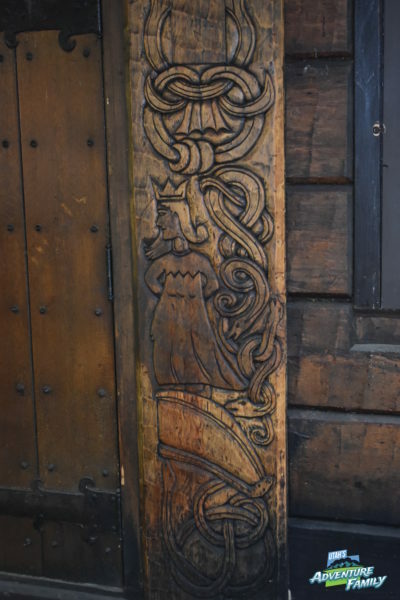 There are beautiful carvings on the outside, too. The views from the rooms are amazing. We loved the courtyard. Visitors drove right into the castle. The rooms are built all around. It is built right next to the Sierra Mountains. There is also a small beach, though we didn’t swim in it because we didn’t want to haul all our stuff for a mile. We did enjoy walking along the edge, and visiting with the geese. 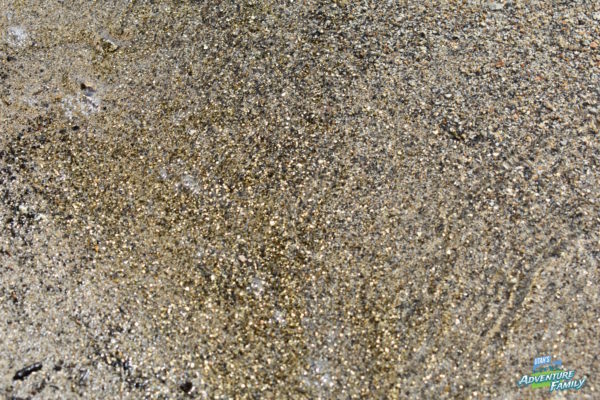 Our boys loved looking in the water because it looked like there was gold along the shore. 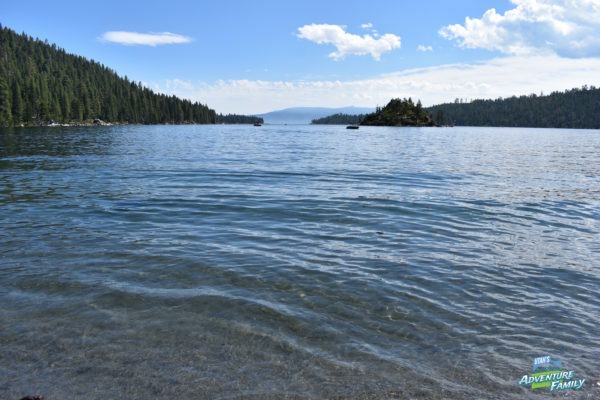 You could definitely wear swimming gear and enjoy the beach and pier at Emerald Bay. The water was high this year, so there wasn’t a lot of beach when we were there. You can see why it’s called Emerald Bay with the green water. We loved the gold specks in the water. The geese were quite friendly and tried to join us for lunch. We actually spent some beach time later this day at D.L. Bliss State Park. 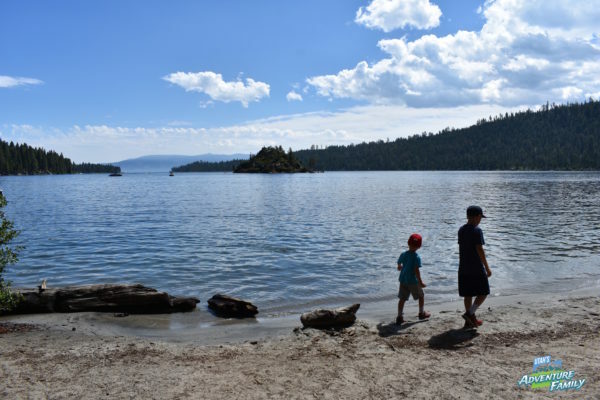 Once you purchase admission to Emerald Bay, it also covers DL Bliss State Park, so you can spend time in both parks for the day. 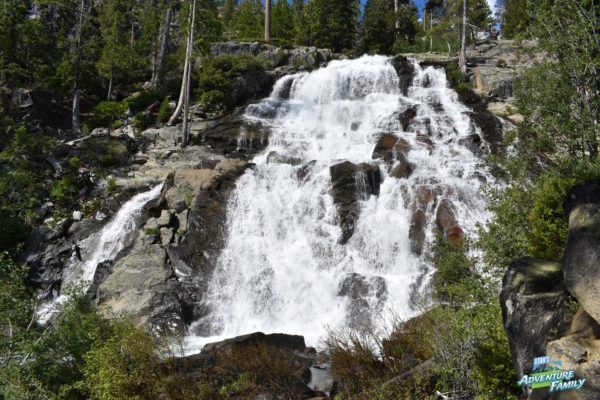 The last thing to do at Emerald Bay is take a short hike to a beautiful waterfall called Lower Eagle Falls. 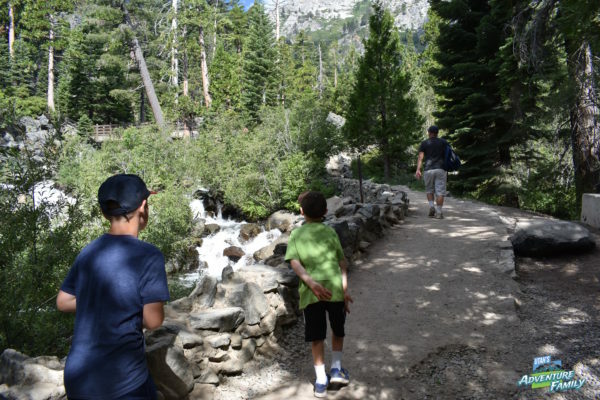 It is only about a quarter of a mile to the waterfall from the cabin where you purchase tickets, and though it is uphill, the climb doesn’t seem very steep. The waterfall is really gorgeous. There is a nice cascade, much prettier than Upper Eagle Falls. We loved feeling the spray on our face! 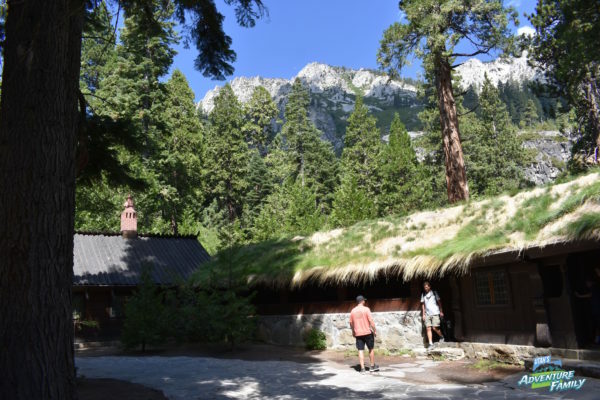 There is a small Visitor Center where you purchase tickets for Vikingsholm Castle.The trail for Lower Eagle Falls is behind the Visitor Center. The trail walks along the river for most of the time. The trail is pretty rocky. 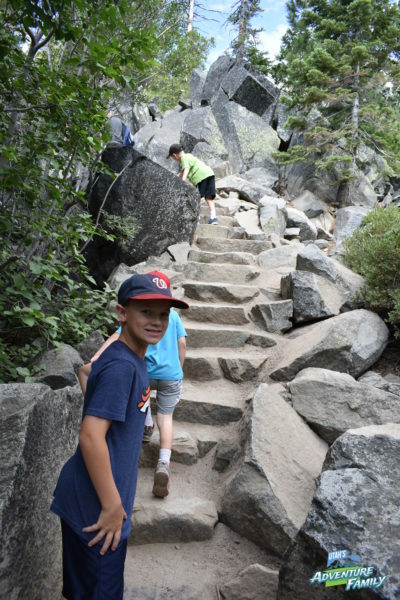 There are a few sections where you climb some stairs. Lower Eagle Falls is beautiful and worth the hike. 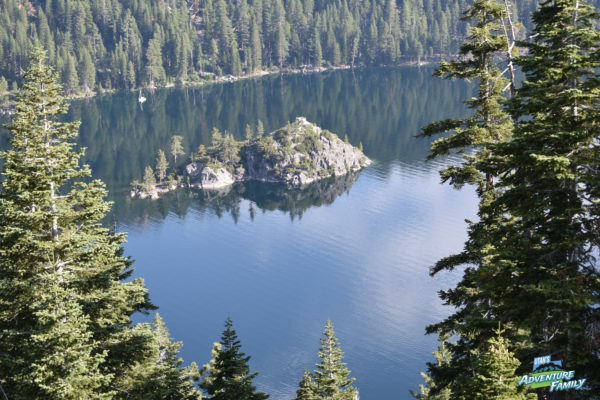 Emerald Bay is our number one recommendation when visiting Lake Tahoe! 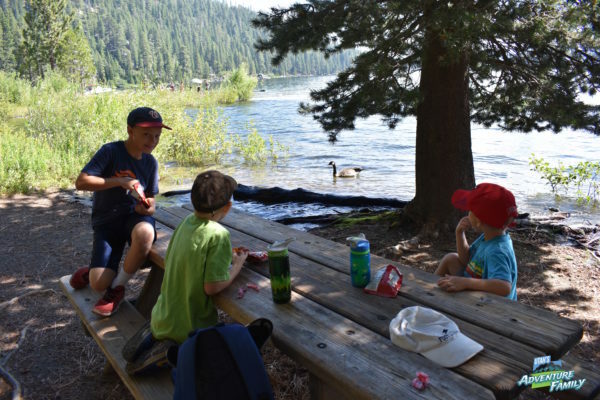 We had a lot of fun spending the day at Emerald Bay State Park. 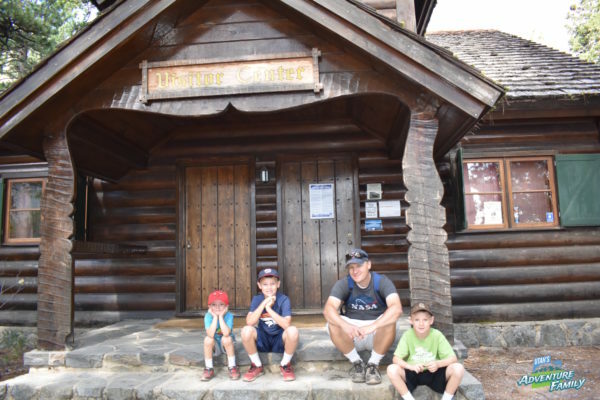 We had a wonderful time at Emerald Bay State Park. On the south east side of the bay, there is a campground. We didn’t camp, but if you are looking for a place, this would be a beautiful spot. 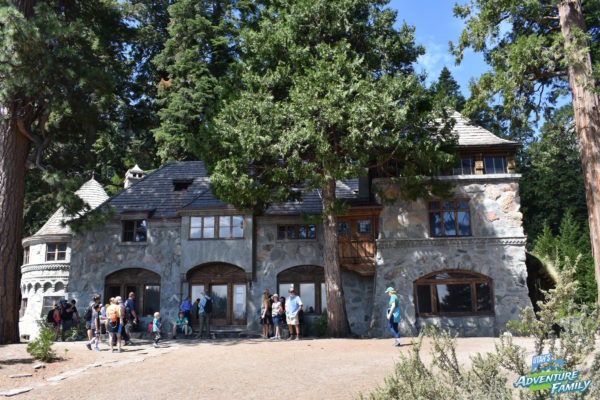 There is a $10 entrance fee to Emerald Bay State Park. 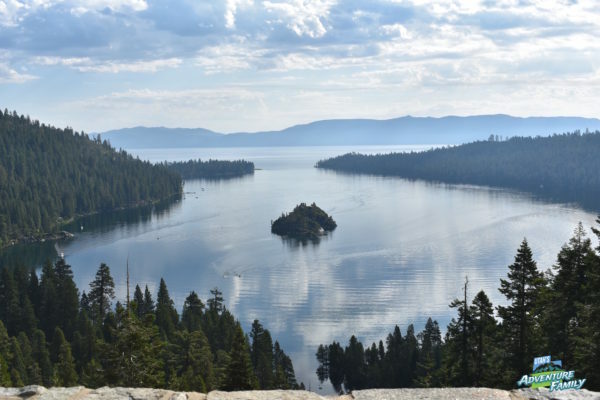 This fee covers Emerald Bay and DL Bliss State Park. 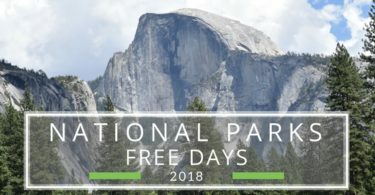 Dogs are not allowed at the state park other than in the campground area. They are not allowed at the beach or on any hikes.